This guide has been a long time coming! My apologies for taking forever to get this live. When I got back in town it was Thanksgiving, and then all my content shifted to holiday after that! I like to be pretty thorough with these guides, which is also why it takes me awhile longer to get these done. AirBnB – I found that most hotels in Tokyo are either extremely pricey and nice, or sort of expensive and crappy. We couldn’t find a good middle ground, so we opted to rent an apartment via AirBnB instead. Since we were there for a total of five nights, this actually was perfect – we had a little kitchen, washer/dryer, and a living space where we could workout/keep our luggage. I would highly recommend AirBnB if you are traveling for several days! Just be sure to do your research, look at the reviews, photos, neighborhood, etc, and you should be fine. I would recommend staying in the Omotesando or Ginza neighborhoods. The Peninsula – for a truly luxurious experience, the Peninsula is part of the ritzy Ginza neighborhood, and just a few steps away from the Imperial Palace and Gardens! Lots of amazing designer shopping nearby. Tokyo Station Hotel – if you’re looking for a boutique hotel, look no further than the Tokyo Station Hotel. The interior design of the rooms is impeccable, and the lobby is just as good. White marble everywhere. There are several awesome restaurants attached to the hotel, and the fact that it’s next to Tokyo Station make it ideal for those of you planning to use the trains. PS – there’s an amazing mall right across the street with a bunch of local designers and brands. It was so much fun to peruse and see all of the styles over there! Ochi Kochi – on our first full day in Tokyo, we had hoped to grab lunch at a popular restaurant known for their tempura. Unfortunately, when we tried to walk in, the hostess told us it was completely booked and they weren’t talking walk-in’s that day. We then tried to stop in another restaurant a few blocks away only to find they didn’t have a menu with pictures or ANY English – fail. Finally, just a few blocks further we found Ochi Kochi. This little spot is perfect for ladies who lunch! We ended up having to wait for 30 minutes, which suited us just fine – we were just happy to have a seat after walking all morning! We were ravenous at this point, so we each ordered the seafood rice bowl lunch special, PLUS the an order of the deep fried oyster lunch special to share. The oysters were perfection! We were both expecting the seafood rice bowl to be like a fried rice situation, but it ended up being slices of sashimi over a warm bowl of rice. If I had known that, I wouldn’t have ordered it, but I’m glad I did! I tried each piece of fish and loved each and every one. The lunch special also came with miso soup and a bowl of noodles – needless to say we left with full bellies. If you’re looking for a civilized spot for lunch, definitely try Ochi Kochi! Tsukiji Market – Tsukiji Market is THE place thousands of restaurants worldwide buy their seafood, especially fresh tuna. In addition to visiting the markets and checking out the live auction (if you’re down for the 3am wake up call! ), another way to experience the fish market is to go early and have breakfast! After wandering through the market a bit, we found a teeny little sushi bar in one of the alleyways. There were only ten seats and only two were open, so it felt like fate. The server greeted us with hot green tea and menus – luckily there were photos, otherwise we would have had no idea what to order! We each decided to order a sushi sampler of 8 different pieces, then I requested two pieces of sushi and Jess ordered tuna a la carte (or so she thought). She actually accidentally ordered a whole plate of it! We were surprised, but didn’t complain one bit. It doesn’t get fresher than fresh of the auction block at Tsukiji Market! Tuna in the US can sometimes have a fishy flavor, but the tuna at this spot was absolutely incredible. Best you’ll ever have! Everything we ate was great, but the pieces of tuna totally stole the show. Afuri – if you followed my snaps in Tokyo, you may have seen this spot pop up. Upon entry to the restaurant, you are asked to place your order and pay using a vending machine! Before ordering ourselves, we had to watch someone else do it in order to get the gist of it. Once you order and pay, the machine will spit out a ticket of your order which you then give to one of the servers. Once a seat opens up, they’ll ask you to sit, and then serve you your ramen almost immediately! It’s really very efficient. The ramen at Afuri is a traditional style featuring a pork-based broth, egg, sliced pork, bamboo shoots and more. Because I couldn’t understand what was on the vending machine, I accidentally ordered an extra few slices of the pork, but I’m SO happy I did. They were little slices of magic, I kid you not. So salty and rich! They really added the perfect flavorful punch to the ramen dish. This spot is very casual and ideal for lunch! It’s actually right around the corner from great shopping in Harajuku, so stop in here after you’ve picked up some panda socks! Kagari – this ramen joint was on my list of restaurants to check out, but when looking at the photos of the food people posted on Yelp and TripAdvisor, I was a bit turned off. I’m so, SO glad we decided to go though! It is one the best ramen dishes I’ve ever had in my entire life! That’s saying something too, because I’ve eaten A LOT of ramen. Unlike traditional Japanese ramen in a seafood or pork-based broth, Kagari’s most popular ramen noodle soup is a creamy chicken broth. We arrived at Kagari at 5:30pm and waiting about an hour for a seat, and while we waited the waitress came to take our order. By the time we sat down at our seats at 6:30, the ramen was fresh, hot and ready to be served! The noodles were a little thicker than the ramen I’ve had in the US, which I really enjoyed. The creamy chicken broth is heavenly – so rich and flavorful! You can also add extras like egg, garlic butter, more chicken slices, etc. There are only eight seats in total at Kagari, which is why there’s always a wait – get there early! I promise, it’s worth the wait! Kaikaya by the Sea – just a warning, this is sort of touristy spot. Not many Japanese people were eating here when we went, and they have an English menu. With that said, the food was amazing and the restaurant is adorable! You will definitely not walk away hungry from this spot. Don’t miss the sakura ice cream at the end! Maisen Tonkatsu – this restaurant is favored by locals and known for it’s Tonkatsu! If you’ve never heard of or tried it, Tonkatsu is a dish of deep fried pork, usually with a side of shredded cabbage. The menu is very detailed, featuring the various cuts of pork you can choose from, and going even further, you can pick specific types of pork coming from different farms and vendors. Under each offering, it shares the flavors, marbling and other qualities and characteristics from that specific brand of pork! It was actually very interesting to read. This meal is on the heavier side and at Maison is only available at lunchtime, so keep that in mind when planning out your dinner reservations! Maisen Tonkatsu is located in the posh neighborhood of Omotesando, so perfect for stopping in after doing a little shopping! Sushi AOYAGI – this is one of the fine dining restaurants I mentioned at the Tokyo Station Hotel. It’s a teeny tiny sushi restaurant, featuring a very lovely waitstaff and chefs – they kept looking over to make sure we were enjoying every dish from behind the sushi bar!The service is impeccable, and the sushi was prepared and presented in the most beautiful way. They didn’t speak much English though, so we reeeeally didn’t know what we were eating. This was probably the most adventurous of the sushi spots we tried! We tried a sushi tasting of 10 different plates including sea urchin, fatty tuna, mackarel, salmon roe, salmon, octopus, etc. If you followed on SnapChat, you saw all of these and more! This was certainly the most elegant dining experience we had in Tokyo, so this would be a fabulous spot for a date night dinner. Harajuku – if you want to get a taste of the fashion scene in Tokyo or are looking for some fun things to take home, spend a few hours shopping and wandering around Harajuku. I found the cutest iPhone case featuring gold cat ears, two perfect plaid scarves, and a pair of sushi socks. So many random but amazing finds! The perfect little souvenirs. Also, the Harajuku area features a lot of color, for those of you looking for photography opportunities – so much pink in this area! If it’s a rainy day, head into Laforet – it’s a pretty sizeable mall featuring a bunch of local brands, and other international ones too! My favorite store in there was Usagi Online Store – so many on-trend pieces at reasonable prices! There’s even a Ladurée beauty store… We made a clean sweep at Etude House though – lots of Korean beauty! Omotesando – considered the Champs-Elysées of Tokyo, this area features a main boulevard of designer shopping from brands like Gucci, Burberry, Celine and more. After doing a bit of shopping (window or otherwise), take a stroll through the alleyways behind this main street where you’ll find a bunch of smaller local boutiques (check out Store Room – so cute!) and great restaurants. It’s an adorable neighborhood! If we’d had another day in Tokyo, we would have spent it here. Too cute! Ginza – similar to Omotesando, Ginza is another very nice neighborhood in Tokyo, and features a bunch of designer shops and fancy restaurants, in addition to being a residential area. Ginza is where our AirBnB was located, which was actually the perfect area for our trip. It was walking distance to a ton of restaurants on our list, Tsukiji Market, the Imperial Palace + Gardens, and more. Shinjuku – this area features the Red Light / Entertainment District of Tokyo. While I wouldn’t recommend hanging out in this area at night alone, it is completely covered in crazy neon and colorful signs – totally worth it for the photos and experience. Sensory overload. It’s definitely a site to be seen, as evidenced by these photos. Shibuya – a totally touristy thing to do, but you just have to go! Shibuya Crossing is a massive crosswalk featuring a backdrop that’ll remind you of Times Square. The scale of this area is just unbelievable. Check out this post to see some pics! Tokyo Tower – if you have an hour to spare, go up to the observation deck in Tokyo Tower. I’m terrified of heights, and while the elevator ride was super scary, I was perfectly fine once we got to the enclosed observation deck. We were able to capture the most INSANE views of Tokyo from above! It was awesome. Try to go right at 9am when it opens – there was nobody there for like 30 minutes, so we didn’t have to fight people for views/photos. Tsukiji Market – the early bird catches the worm with this one, folks! If you are a die-hard sushi fan, you can go to Tsukiji Market to watch a live auction happen for the freshly-caught tuna and other seafood at the market. Not into early wake-up calls? Just head over there around 7 or 8am for breakfast and wandering around the market stalls. To see photos and learn more about our experience at the market and a peek at our sushi breakfast, check out this post! Imperial Palace & Gardens – I should have done more research prior to our arrival, because apparently you have to request access to the Imperial Palace several weeks before! We only got to see the gardens, which to be honest, weren’t anything super special (especially when compared to our day trip out to Nikko). If you can get tickets into the palace, I would definitely say go to that, but if you are short on time and need to cut a few activities, this garden wasn’t my favorite. Day trips – Tokyo certainly has a lot to see, but there are so many wonderful spots for day trips that offer something a little different. Of all the places you can go, we narrowed our day trips down to Nikko and Kawaguchiko (aka the five lakes around Mount Fuji). Unfortunately our Fuji trip got rained out, but we absolutely LOVED exploring Nikko and all it’s beautiful temples, shrines and autumn scenery. You can see more from our Nikko trip and exactly where we went in this post! 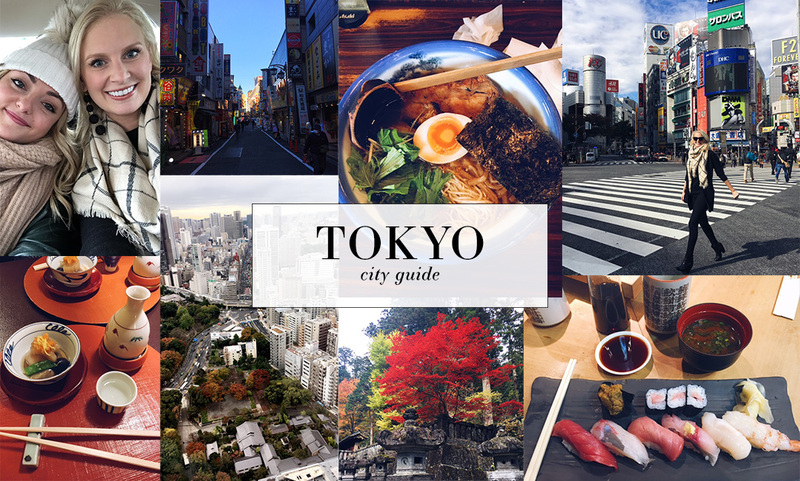 Stay tuned for the Kyoto and Hong Kong city guides, along with a post on important things to know when traveling to Japan (and really East Asia in general)! We’re heading to Japan in March I’ll keep all this in mind thank you! Wow what a great guide! I’ve only passed through once – years ago. But I’ll keep this in mind for when I visit again.